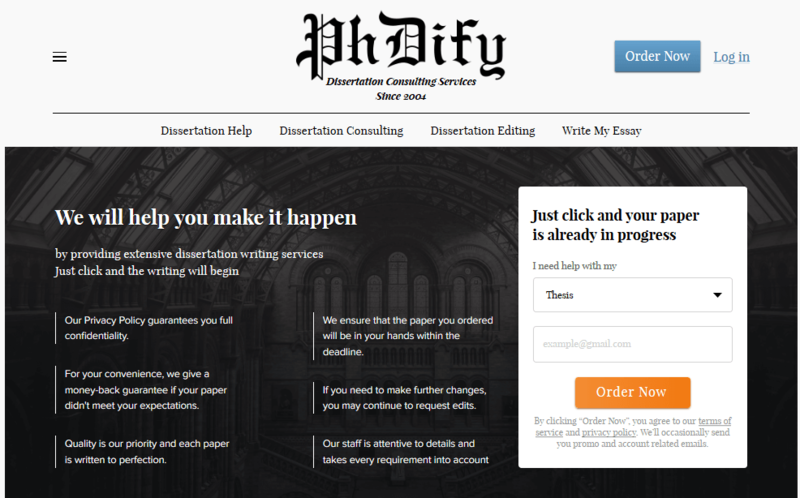 PhDify.com say that they can help you with any writing tasks, including dissertation writing. Can they be trusted to give you the level of writing you need? Read on to find out if they’re the writing service for you. Right now, there are just under 100 writers working with this service, 18 of whom are from the UK. There’s 58 writers with PhDs and 21 with Masters degrees. This is an average amount of writers to have on staff, and there’s a good amount of PhD level writers there too. However, only 18 of the writers are UK natives. That’s a very small percentage, and you may not get a writer who speaks native English. When you order an essay with an essay writing service, you need to know that your privacy is being taken seriously. Will PhDify respect your privacy? The best way to find out is to read the website. There is a small section of the home page that details that no one will know that you ordered from this service. However, there’s no guarantee that your details won’t be sold on to a third party, so you can’t be sure that the process is totally private. You need to know that whatever writing service you’re using, that they’ll be able to write an essay that’s worth paying for. What’s the quality of the essays from PhDify, and are they worth it? We looked at reviews from past customers to see what they had to say. From what we saw, there were a few issues with important aspects of essays being left out of the essay. This included sections such as the bibliography, as well as knowledge that should have been included in the essay. As with most writing services, prices will vary depending on what you need. As an example, take a 2 page, an undergraduate essay that’s due in 10 days. With this service, you’ll be paying $50.50. You can get additional services, such as assigning a special writer for $9.99, an essay outline for $25.25, VIP support for $12.99, progressive delivery for $8.99, or 1 page abstract for $9.99. There are no additional discounts for first-time customers. If you need help with your order, or you just have questions, you can get in touch with the customer service team. They’ll help with any issues you have. Be aware though, that many customers have found that it can take quite a while to get an answer from the team when they need it the most. This isn’t optimal, as you’ll be up against a deadline and so will need an answer as soon as possible.